Who is CJ Custom Clothiers? Founded in 1994 by bespoke tailor Clarence Jones, CJ Custom Clothiers offers bespoke suits and shirts– clothing designed to the customer’s specifications. The bespoke technique is a collaboration between customer and tailor: the customer provides input in the making of his or her garment while it is customized by the capable hands of a Professional Clothier. Whether your attire is for business or pleasure, CJ Custom Clothiers can help develop the unique style that will set you apart from the crowd. CJ Custom Clothiers is dedicated to delivering fine, fit-style suits while providing outstanding customer service. Each suit and shirt is hand cut, giving the customer several selections from some of the finest fabrics, patterns and fit. Because our mission is to cater to you, a Personal Professional Clothier will fit you at your convenience in your home or office. Your garment will then be hand delivered in approximately three weeks. CJ Custom Clothiers offers custom made suits, jackets, pants, vests, overcoats, linen suits, shirts, cargo pants and short-sleeve shirts. Our company carries the latest seasonal fabrics: Sea-Island Cotton, Italian and Egyptian Cotton and super 130 and super 200 wool from Australia, Italy and England. CJ Custom Clothiers offers over 25 different collar and cuff styles for shirts. Custom made shirt pricing starts at $150 and custom made suit pricing starts at $1250. Prices vary depending upon fabric choice. 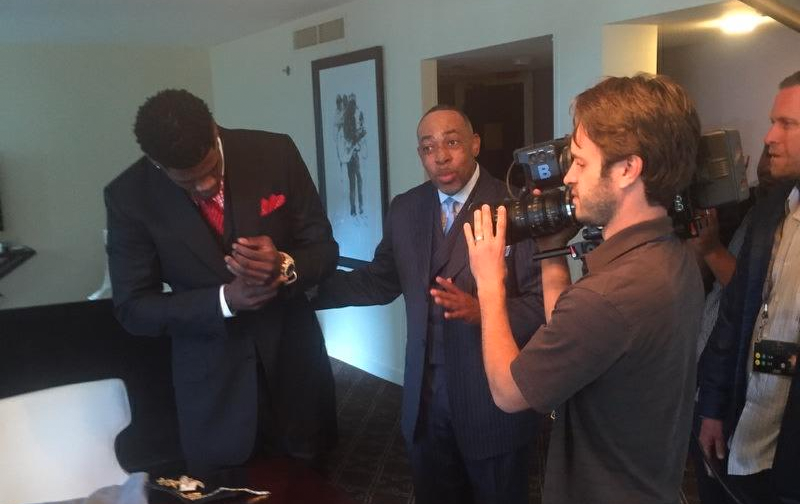 CJ Custom Clothiers is the only African American-owned company in the NFL and NBA drafts. We have provided custom designs for professional athletes like All-Pro Wide Receiver AJ Green Cincinnati Bengals, Randy Gregory DE Dallas Cowboys, Mason Plumlee Center Denver Nuggets, John Henson, PF Milwaukee Bucks, assist coach Jeff Capel Duke University, Tom Bowen University of Memphis, Bubba Cunningham University of North Carolina, Detroit Pistons Head Coach/President Stan Van Gundy and Assistant Coach Tim Hardaway, LA Rams NFL DT Michael Brockers, Houston Texans DE Benerick McKinney, NFL All-Pro WR Philadelphia Eagles Alshon Jeffery, NBA Golden State Warriors Center Javale Mcgee, Minnesota Timberwolves Center Justin Patton, Denver Nuggets Guard Malik Beasley, Memphis Grizzlies Forward/Center Deyonta Davis, Oakland Raiders Bruce Irvin, Joshua Jackson Greenbay Packers, 2016 Wooden Award winner and NBA lottery pick Buddy Hield Sacramento Kings, 2018 Wooden Award finalist and Freshman of the Year Trae Young University of Oklahoma, DaRon Payne Washington Redskins, Taco Charlton Dallas Cowboys, Ronnie Harrison Jacksonville Jaguars, Donovan Mitchell Utah Jazz, Grady Jarrett Atlanta Falcons just to name a few. CJ Custom Clothiers has been featured in Jet Magazine as well as other media sources . Assistant Coach University of Wisconsin Howard Moore, WGN Chicago News Anchor David Kaplan, Assistant Basketball Coach University of Illinois Ron Coleman, Comedian Steve Harvey, and a host of other notable figures make up CJ Custom Clothier’s high-profile clientele. Our notable clients know how unique they are, and that they deserve the suits to match.